I used to think if I was going to be a stay-at-home mom, then I’d better have a super clean house to show for it. So, I spent my days creating and following cleaning routines, and my little girl spent her days following me around the house. The guilt that comes with how clean your home, along with the struggle to be present in your child’s life, is all too real. But, it doesn’t have to be. I’ve discovered a happy medium; the secret to keeping the clutter away, while still being present for my family. I want to help you do the same. Have a morning and evening routine. That’s it. 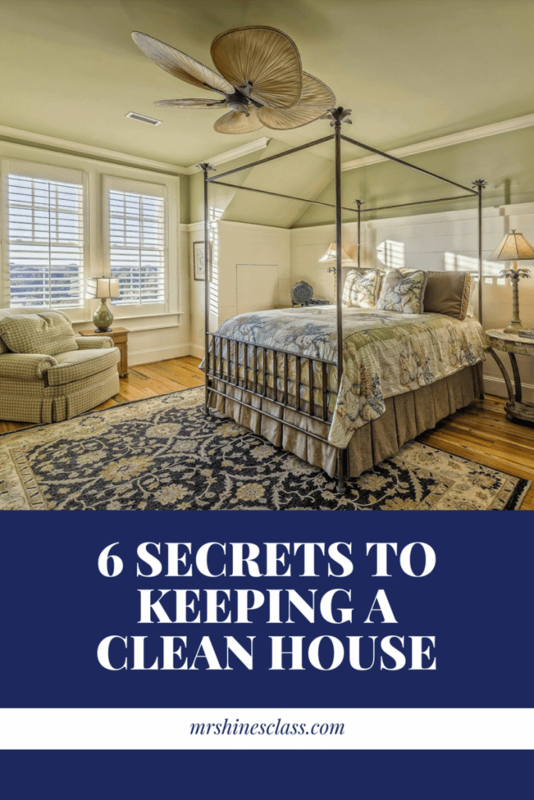 Each routine is designed to quickly clear away the inevitable messes from living in your home, and shouldn’t take more than fifteen minutes each. Let’s use mine as an example. This post may contain affiliate links. I may earn from qualifying purchases. When you get up for the day, pull your bedding back to let your sheets air out. In the meantime, take the time to change out of your pajamas and get dressed from head to toe. You can look pulled together with very little effort, and you’ll feel more productive. Once you’re dressed, go ahead and make your bed. I know some people say they prefer a messy bed, but I’m going to challenge that. What really happens is you get used to having a messy bed and the mess becomes background noise; visual clutter that you don’t necessarily notice on a conscious level, but that your brain takes note of every time you pass it. This small act unwittingly taps into your mental and emotional energy, draining your capacity to focus. On the other hand, making your bed makes your bedroom feel like the restful retreat that it is meant to be. And, it’s so much more inviting to climb into a made bed at the end of a long day. Nothing makes me feel more accomplished than hearing the swishing of the washing machine. Doing just one load a day makes doing laundry more manageable. The key is to complete it, wash, dry, fold and put away over the course of the day so clean laundry doesn’t start to pile up and take over. And that’s your morning. The house feels clean, you look good, and you’ve got the whole day ahead of you! I prefer to do this at night before we go to bed so that I wake up to a clean slate the next day. It only takes a few minutes, especially if everyone in the family is responsible for putting away their belongings and messes. Involving everyone in your household is key to success with any routine. After dinner, wipe down the kitchen counters, sweep the floor and empty the sink of all dishes. Depending on your kids’ ages, they can be responsible for kitchen clean up. As you walk through the living room on your way to bed, put all of the throw pillows and blankets back in place, giving the pillows a little fluff. If there are kid toys strewn about, have the children put them away before their bedtime. Now the room is fresh and ready for a new day. This simple routine leaves my house looking pretty clean and me feeling accomplished at the end of the day. But, as I discuss in Creating Success At Home, your definition of clean will likely change with each season of life. However you define clean, be careful not to let it define you. Before you go, click here to your free guide to help you kick clutter to the curb. These are great tips, Sharon. I do some of these, but not all. My biggest weakness is the kitchen. Going to work on it! Luv the tips Sharon. I am a stickler for a tidy home. 20 years ago I left teaching to be a stay at home mom. The baby is 20 🙂 and I am still here. Now I am a stay at home painter and after school (sometimes) grandmother to our dear Bella. Like you I put my feet on the floor and start to move for the day… getting dressed then making the bed. Then coffee and the rest of the home. The last thing I do at night is pull things back together so in the morning we do not face chaos. Sharon, like your tips. I have been staying home since I got diagnosed 20 some year ago. I have to say the first thing I do is make the bed and take care of the pups and then make sure the kitchen and the bathroom is clean everyday. I then take it from there and clean as I go. I try and do something everyday and in the new house it will be so much better being on one floor!! Great tips, Sharon! If I don’t make the bed, get dressed and ready and put in a load of laundry first thing in the morning, my day just feels more chaotic all day long. But if I get these few things done, I feel like I’m off to a productive start. I couldn’t agree more, Susan…of course it’s 2:45 p.m. and I’m still in my underwear. 🙂 I blame it on ADD. I like your plan to “take it from there” that’s a good way to put it. Can’t wait for you to be in your new house!! I know you’re excited. LOL! We’re two peas in a pod, Gee. ….my baby is 15 and I’m still here… I actually went back to the classroom for a while there, but am home again and couldn’t be happier about that. I think not facing chaos in the morning is key to a good day. Great tips!!! But it sounds just like Flylady! Get dressed to lace up shoes is one of her mottos, make the bed, do the bathroom swish and swipe, and she has weekly and daily routines for each room. Read your blog for the first time today and truly enjoyed it – even though I’m a working wife that’s 60 yrs. old, I still struggle to keep my house presentable. Will be visiting this site more often. Welcome Sally! I’ve heard of Flylady but don’t read her blog. Sounds like I should. Great article Sharon & thanks so much for the shout-out! I loved your post, Michelle…had to share it! Taking some time for you is very important! I try to do that too. Great tips, thanks! I have to have my house tidy before I leave it too, I don’t like coming home after a long day to do more work. Agree – and on the nights when I’m not falling asleep on the sofa – I definitely (try) to do this! And I can’t live with an unmade bed – the rest of the room can be in complete chaos but if the bed is made I feel better! me too, Kelly…a made bed covers a multitude of sins! I feel the same way..it’s so much more pleasant to come home to a tidy home instead of seeing a “to-do” list when you walk in the door. But I had a much harder time keeping up when I was still teaching. I think it was more of a time management issue than anything else. Great advice! I always make my bed for exactly the reasons you noted above. There’s just something about a made bed that makes it all seem straight and clean. Wonderful tips, Sharon. Thanks so much for sharing them. Anytime..these are my favorite kinds of tips to share. Great ideas… I really do need to create an “everyday cleaning routine” and this is definitely manageable. Maryann, this has been so manageable. I feel like it sets me up for success and I feel so productive at the end of the day. Dynamite tips! I use them too… it’s amazing how spending a couple of minutes making the bed or picking up after yourself can do wonders for how the house looks! Thank you, Jen. It makes all the difference, doesn’t it.